The Wimberley Sidekick is used to convert a strong tripod ball head such as an Arca-Swiss Z1 Ball Head (see note below) to a gimbal-type head. A gimbal mount is typically used for mounting a super telephoto lens to a tripod. The weight of the lens and camera is positioned below the head's pivot point. This takes away the tendency for the camera and lens to flop over (a potential catastrophe) and makes positioning the camera and large lens easy. A full-sized gimbal head such as the Wimberley Tripod Head II is the ultimate solution for the largest super telephoto lenses made, but the Sidekick has some advantages. The first advantage is the cost - The Wimberley Sidekick is about half the cost of a full sized gimbal head. It is also a fraction of the weight. 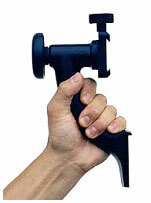 Of course, the full size Wimberley Tripod Head does not require the additional cost, size and weight of a ball head. But, you probably want a ballhead anyway - and likely will want it with you as the Wimberley Tripod Head does not make a good smaller lens support. The Wimberley Sidekick makes an especially good long lens travel support. Space and weight savings are especially important when traveling by air and again, you will likely want to take your ballhead along anyway. The SideKick is a much smaller/lighter addition to your luggage than a full Wimberley. The full Wimberley Tripod Head will support extremely heavy camera+lens setups, but the Sidekick is a good option for lenses up to and including the Canon EF 500mm f/4 L IS USM Super Telephoto Lens. The Wimberley Sidekick requires a compatible lens plate such as the Wimberley P40 Lens Plate I use on my Canon EF 500mm f/4 L IS Lens. If your Arca-Swiss-compatible ballhead quick release clamp is the lever-style, you are going to need the Wimberley AK-100 adapter to insure a safe attachment. Like all Wimberley equipment, Sidekick is very well made. Lock the Sidekick in place and nothing moves. If the functionality and purpose of this support meet your needs, it is a good purchase. Note: There has apparently been a slight design change in the Arca Swiss Z1 Ballhead that adds risk to the use of a Wimberley Sidekick on it. Details can be found on Wimberley's site. But, according to Arca-Swiss, the problem experienced was due to a manufacturer assembly error in a very small percentage of the ballheads manufactured prior to June 15th.